Whole body support to help active dogs go the extra mile. For dogs 1 year and up. Daily nutritional support to help them lead the pack. Made with everything your dog loves. (Per 50lbs of body weight) Add Genesis powder directly to the dog’s food or mix with water. One level scoop is approximately 1 oz. GENESIS is amazing. Its been a daily feed ingredient for the past 5 years. It allows my dog to correctly process their food, and thus maximize the benefits of a complete balanced diet. Feeding Genesis keeps my team healthy. They have a better tolerance for stress, as their body, stomach and digestive system are working correctly, and allowing my dogs to be at their best all year long. My dogs deserve the best, and the best is GENESIS. The Genesis supplement is a one-of-a-kind, multi-system support program. It was created to meet the needs of active dogs by simultaneously supporting many systems in the body. Because when your dogs’ overall health is supported, they’re able to reach their fullest potential. From foot support to gut health, Genesis can bring a lot of great health benefits to your dog. If we’re being honest, it’s one of our favorite products. Here’s why. The digestive tract is the beginning of your best friend. It’s where everything starts. We decided that, in order to make a canine supplement that can do more than what’s on the market currently, we needed to start at the beginning. Genesis helps condition the digestive tract properly so your dog can absorb the great products that you provide for them. It’s the way things were meant to be. After all, what good is a super premium dog food if your dog’s digestive tract isn’t taking in those beneficial nutrients? Research has shown by using a group of specific proteins that contain a special balance of peptides, we can significantly increase the intestinal tissue health in canines compared to diets not containing this balance. But wait a minute, what is a peptide? Sounds like something a surfboard would go well with. Actually, a peptide is a group of short chains of amino acid monomers linked by peptide bonds. In simpler terms, peptides are simpler compounds found in proteins. By using these specific peptides, we can greatly increase villi tissue, which is where the first steps of absorption occur in your dog. Electron microscope images of intestinal tracts treated with these peptides show evidence of this. This is the best start possible to a solid dietary foundation for you dog. 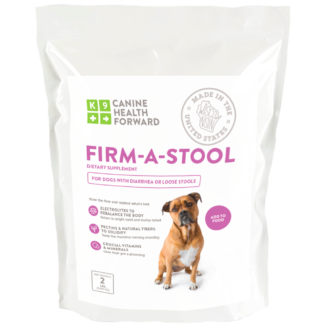 Now that we have that gut in the best shape possible, we need to create the friendliest of environments for your dogs digestion. We want your dog’s gut to feel better than a belly rub, at all times. To do that, we added a specific probiotic package with a high CFU count. CFU? Sounds like we’re using code words, but it’s simply an acronym for Colony Forming Unit. A CFU is how probiotics are measured. We guarantee a CFU count of 113,000,000 live probiotics in every 2 oz. of the Genesis product. You may be shocked by the high count, but the facts are facts and that is what is needed to do the job. That is what we at Canine Health Forward do. Then, we needed to add a natural balance of fats and proteins—like Mother Nature intended. Learn why this protein and fat balance matter to your dog. It is no secret that dogs are carnivores, and are designed to eat primarily animal meat and fat sources. Both fat and protein digestion occurs primarily in the small intestine. As we discussed in Aiding Digestion with Genesis, conditioning and strengthening the health of the intestinal wall to increase absorption helps your dog reach his or her potential. Let’s take a closer look at the fats and proteins that we are using in the Genesis product. A compatible ratio of fats to proteins will greatly help maintain a proper digestive tract environment. Too much fat or too much of the wrong type of fats can easily disrupt this digestive tract environment. Here at Canine Health Forward, we believe that Mother Nature has developed the very best balance of fat to protein ratios and in a chemical structure that best fits canines. Genesis provides natural animal fats that are found in our meat ingredients. A quick look at the protein sources in the Genesis product shows that we use only spray dried meats. You probably hear “spray dried” and think, “I don’t want anything sprayed on my dog’s supplement.” But actually, this process preserves protein quality. 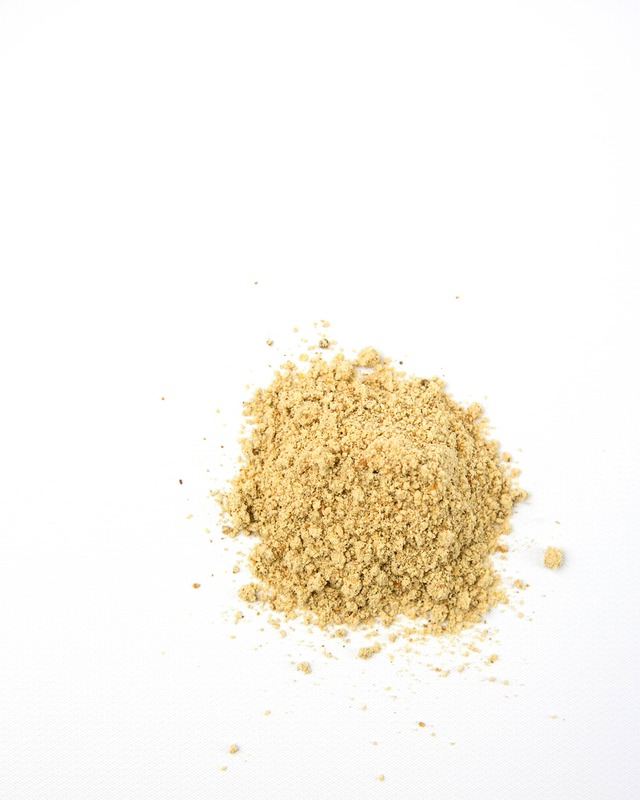 Here’s what spray drying means: a fine mist of meat particles is sprayed through a nozzle. When the product goes through the nozzle, it is projected through a column of air that is the correct temperature (205 to 212 degrees) to not only dry the meat products to a dehydrated form, but to also subject it to this temperature for a moment. A split second, really. Exposing the meat product to the correct heat for a short amount of time ensures that the key amino acid profile, or attributes of the protein, are not broken down or altered. Another benefit to this type of drying is that any bacteria that could be in the meat source is killed. This ensures a 100% bacteria-free meat product with an intact amino acid profile. That’s something you won’t see in traditionally dried meat products. Canine Health Forward meat products are guaranteed bacteria-free and not damaged by heat. The addition of non-animal vegetable fats as a major dietary source of fat may disrupt normal digestive process, challenge the immune system and lead to less-than-optimal performance. We steer clear of these because we wouldn’t put that in our own dogs’ bowls. Not to mention in the small intestine, where it can really wreck havoc. If we want that optimum ratio of proteins to fats and vice versa, we have to look at a fats a bit closer. Each type of fat has a different chemistry profile that we call the fatty acid profile. This fatty acid profile has a lot to do with how well the fat is digested and how it compliments protein for utilization. For example, a fat found in a given protein source nicely compliments the protein digestion of that protein source and vice versa. The chemical structure of the fat and protein in that meat source are not only compatible, but they are also supportive to each other for proper digestion. Again, this is all by mimicking Mother Nature and the way food is meant to be. 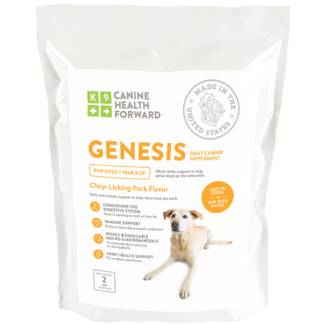 Genesis provides an extraordinarily high performance blend of natural-source animal fats and compatible animal proteins for your dog. You will not see any vegetable-based fats such as coconut oil, corn oil or canola oil in Genesis. And that’s for a reason. Macro minerals are the minerals that are used in your dog’s body in large amounts, plain and simple. Calcium, phosphorus, magnesium, potassium are all in this category. Even though all of the macro minerals on this list are very important, there is one which tops them all. Calcium. As many of us know, calcium plays an important role in the body including strengthening teeth and bones. However, there are a number of critical roles that calcium plays in the body. First off, calcium contributes to the tone, strength and function of smooth muscle in the dog. Examples of this are the heart muscles, the digestive tract and the reproductive tract. If the readily available tissue reserves of calcium are depleted, the dog’s body will attempt to mobilize calcium from the bones to meet the requirements that the dog is demanding. Moving calcium from the bones to meet these needs requires increased acidity in the body and is not a desired approach to either short/long term performance. And certainly not for long term health. Many manufacturers will use large amounts of poor quality calcium with poor absorption rates that can cause reduced smooth muscle tone, depressed heart function, compromised physical strength, poor endurance, depressed immune function and even poor reproductive performance. In other words, quality matters when it comes to macro minerals. Let’s talk about the second major role that calcium plays: the role of the great transporter. That might sound a little science fiction, so let’s define it a little better. Available or soluble calcium plays a major role in supporting the utilization of other key nutrients. When body tissue is in short supply of usable calcium, many other nutrients and trace minerals are not utilized properly or to their fullest potential. To make that a bit more simple, imagine a circle made of every nutrient in the body including calcium. If you were to draw a line from calcium to every nutrient that it helps use, and then a line to the next nutrient that is affected, you would have what looks to be a ball of string with lines crisscrossing all over the circle. This visual shows how important calcium is in using just about every nutrient in the body. The idea here is that we require a large amount of calcium for dogs to reach their fullest potential. This is true, but we also need the correct amounts that are of a very usable quality for this to succeed. How did we do that you may ask? We used a type of calcium that is 85% or higher in bioavailability, while conventional sources of calcium used by competitors can be as low as 10% bioavailable. Bioavailability? Sounds like chemistry, you might say. Bioavailability simply means the extent to which a nutrient can be used by the body. Low bioavailability means very little is used. High bioavailability means very much or all is used by the body. To accomplish this, we use macro minerals that are at the highest bioavailability possible. Many dog food or supplement manufacturers formulate products to contain enough calcium or other macro minerals on paper. But they don’t factor in the low bioavailability of the source, and we quickly see that the dog will not absorb the target amounts needed to perform to its fullest potential. This is a lot of information, so let’s review. We started with intestinal tissue that is healthy and absorbing to its fullest potential. We have the perfect natural blend of meat-based fats and proteins that keep a friendly environment in the intestinal tract. We incorporate highly bioavailable, or usable, macro minerals at the correct levels for active dogs. That sounds great. But, it is only a great start. Let’s go forward from there to examine our Trace Minerals. Trace minerals are minerals used in small amounts that are required for optimum nutrition and body function. For this, we choose to use only proteinated trace minerals. Proteinated trace minerals are trace minerals that have been enhanced to increase the bioavailability. The critical trace minerals like zinc, copper, magnesium and cobalt when proteinated are 80% to 90% bioavailable. Compare this to the typical 5% to 40% bioavailability of conventional trace mineral sources. Trace minerals are very important to many body functions in your dog, including immune system function and antibody production, tissue health (foot and pad health), hair coat quality, appetite, reproductive performance, enzyme function, and sustainable good health. Just to name a few. 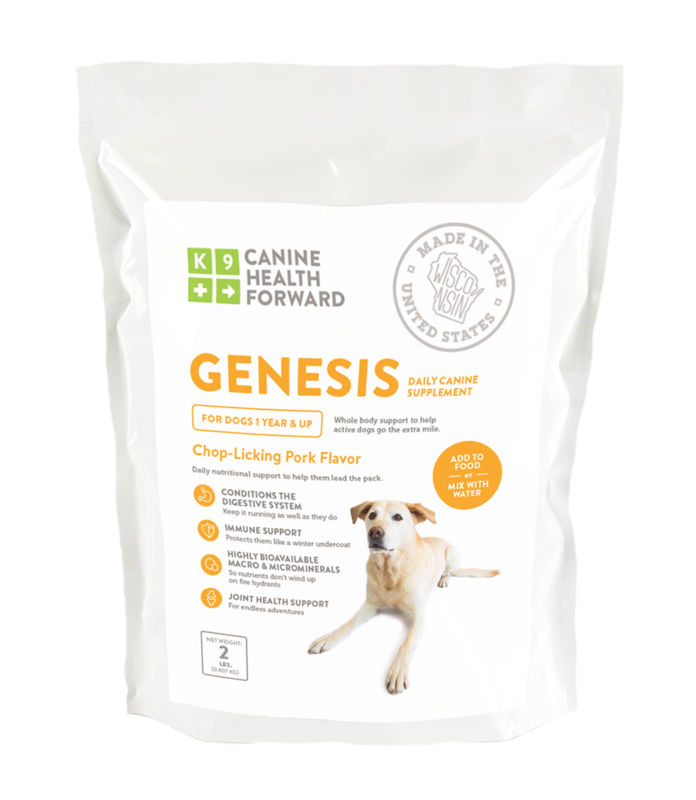 We formulated Genisis with high levels of proteinated trace minerals to complement the conventional dog foods you feed to your active dog. Next, check out the Specialized Vitamins & Minerals we chose to include. Because active dogs require specialized vitamins and antioxidants, we loaded Genesis with the finest of their kind. We started with Vitamin C. Vitamin C is used to boost the immune system, promote healing and fight off illness and remove waste from cell membranes. Conventional, non-stabilized forms of vitamin C function in the body for a short amount of time, which is roughly 4 hours. At that time, it is secreted from the body in the urine. The Vitamin C we use in Genesis is an esterified vitamin C that lasts in the body for 18 hours and is very bioavailable. Imagine it as a timed release of vitamin C that your dog benefits from for 18 hours. That’s almost a full day of vitamin C! We also provide high levels of vitamin E in Genesis. Vitamin E is know as an extremely effective antioxidant that directly supports immune function and helps reduce the risk of immune collapse in active dogs. Vitamin E is also very effective at removing waste from stressed tissue such as skeletal and organ muscles. High levels of B vitamins are also used in genesis to promote appetite and support proper liver function. The liver is critically needed during physical activity because it transfers glucose and energy sources from the diet into the tissue stores of glycogen. Let’s break that process down a bit. When the muscles need energy, the liver converts energy from the diet, and from glycogen, to feed the hard working muscles in your dog. The liver is also critical for protein/peptide/amino acid transfer in the body. Last but not least we included the ultra-antioxidant, Astaxanthin. Wow, that is a scary word. Let’s break down to see what it is and what it does. Astaxanthin is a fat-soluble nutrient that has a very unique molecular structure that makes it such a superior antioxidant. It cleans out free radicals, or waste, from cells in your dog’s body. It is an all-natural material that is found in microalgae grown on the Kona coast of Hawaii. The extract is the most highly concentrated form available, compared to other sources of Astaxanthin. Microalgae contains over three times the concentration of traditional sources such as Salmon and Crustaceans. Astaxanthin is known to protect cells from free radical oxidation, enhance immune support, improve health and longevity and improve breeding. Astaxanthin is so strong that is has been proven to be 500 times stronger than vitamin E and 2,000 times stronger than vitamin C as an antioxidant. With powerful properties like these, we had to include it in Genesis. Next, we’ll look at Pathogen and Toxin Binders. Let’s start with Pathogen binders. Research has showed us that certain all-natural Beta Glucan compounds are extremely effective at absorbing pathogens that may sneak into your dog’s intestinal tract and set up shop. Some examples of these pathogens are E. coli, Salmonella, streptococcus, staphylococcus, campylobacter and clostridium. You probably recognize these as very nasty pathogens you don’t want your dog to carry around. How does the binder work, you may ask. Imagine the binder as a tiny rubber ball. This rubber ball floats down through the gut of your dog unnoticed. The binder looks like the perfect host for a pathogen to set up camp on and spread their disease. What the pathogen doesn’t know is that when they attach to the binder, they cannot let go. At this point, the pathogen is getting angry and to get back at the binder it tries to release its venom and spread themselves. Another thing the pathogen does not know is that while attached to the binder, they can’t spread venom. So they ride along in the gut, angry as a hornet, until they are secreted in the stool into the light of day. Never to harm your dog again. A rubber ball that collects and disposes of pathogens. We loved it, and so will your dog. Now that we had pathogens covered, we decided to use the same technology for binding up toxins. We used toxin binders that were not only active against pathogenic bacteria but also toxins produced by molds or yeast, which are referred to as mycotoxins. The digestive tract can be compromised during times of stress, including travel, new environments, time of demanding physical activity or even a diet change. During these times, pathogens may enter the gut and disrupt the intestinal lining. Genesis acts fast to absorb any toxins if this occurs, and provide a wonderful level of protection for your dog. The other way Genesis protects? By supporting your dog’s health with Immune System Modulators. Don’t let anything sneak in and ruin the fun. It’s important to understand that your dog’s immune system is critical to both short- and long-term health. Viral and bacterial pathogens are constantly present in our environment. Your dog’s immune system is its only effective line of defense against these. The immune system can be compromised in many ways, such as through poor diet, stress over vaccination, the use of antibiotics, physical overwork and toxemia. When the immune system becomes compromised, antibody function is reduced, putting all other body systems at risk. Let’s not go there. When your dog is under stress, there is a natural elevation in stress hormones. These are commonly known as the fight or flight hormones. You probably learned about that in elementary school. The fight or flight hormones, adrenaline and cortisol, are designed to go up during these times of stress and then return to normal levels or a resting state. Now, if these hormones stay elevated for an extended period of time, the adrenal glands can become exhausted. Remember that cortisol that we just mentioned? One key function of cortisol is to shut down non-essential body functions when stress is significant or prolonged. These non-essential functions include the immune system, digestion, appetite, and circulation to the skin. Cortisol allows the body to route energy to more immediate survival functions. We want your dog to avoid this altogether. To do this, we included what are called immune modulators in Revive. In fact, we added several of them. Now, let’s not confuse an immune modulator with an immune stimulant. Immune stimulants, like Echinacea, can only be taken for very short periods of time because they will exhaust adrenal glands and that’s what we want to avoid. The immune modulators that we use bring the immune system to a ready state, allowing the immune system to respond to threats and then return to normal levels and not exhaust your dog’s adrenal function. Documented research shows that the immune modulators we used in Revive improve microphage production and increase Plasma igG and bile igA levels by 25%. This boils down to helping reduce the risks of illnesses during stressful conditions by supporting your dog’s immune function. Dogs definitely benefit from having extra dietary joint support. We believe that joint health should be promoted nutritionally as a grassroots approach: every day in a manner that prevents initial damage to cartilage and joint structure by enhancing the production of synovial fluid on the joint. Joint damage prevention is always better than waiting for joint damage to occur and trying to repair the damage at that stage. Then, you’ll need dietary cartilage rebuilding compounds like glucosamine and chondroitin. With Genesis, we take a different approach and provide joint support that will reduce the risk of damage to joints before it occurs. Genesis contains natural compounds that are known to enhance the production of synovial fluid in the joints to improve lubrication every day not just after an injury. 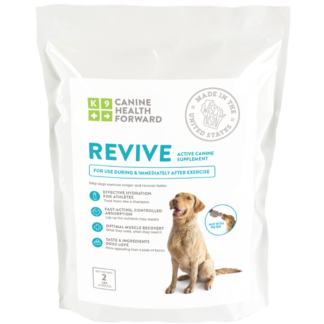 We don’t offer just regenerative support but also the everyday support your dog deserves. Because they’re on their feet all day. Genesis also contains the correct levels of highly bioavailable trace minerals that are known to be directly related to improving tissue health and speeding the repair of your dog’s feet and pads. The foot and pad tissues need to repair themselves as fast as they are being damaged in order to maintain healthy feet. Optimum tissue repair can only be accomplished if the proper balance of nutrients are available to the tissue and the body’s systems are in total balance and functioning well. Genesis not only provides those key nutrients that directly support foot and pad health but has the added benefit of its multi system body support program for better tissue repair. Now that’s what we’re talking about. The result? More durable, healthier pads and feet.